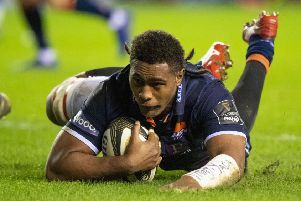 Viliame Mata may not be the only Fijian that Edinburgh Rugby supporters get to watch next season with the club now looking to bring in other Pacific island talent, it has been revealed. Despite a lot of interest from other clubs, it was announced yesterday that Mata – the 27-year-old No.8 known by the fans as Bill – had extended his stay in the Capital until at least May 2021. News of the new, improved deal which overrides his previous one which was due to run out in 2020 means that the strong runner with the deadly offloads will be a focal point of Richard Cockerill’s Edinburgh as the Englishman continues to rebuild a club that was at a low ebb when he joined as head coach back in 2017. Before Mata, the likes of Niko Matawalu and Leone Nakarawa came to these shores and lit up Scotstoun with Glasgow Warriors while fellow Fijian Netani Talei put in a great shift for Edinburgh between 2010 and 2013. Mata, who had never lived outside of Fiji until 2016 when he moved to Scotland, knows there are good players just waiting for the call in his homeland. “Yes, there are a lot of guys over there [with talent] and if clubs here are searching for talent they should be looking to the island and hand picking those guys,” he said. And Edinburgh head coach Cockerill admits he is looking for even more ‘X factor’ players from the Pacific island nation to boost his playing pool ahead of 2019/20. Cockerill said: “We’re looking for more talent – Fijian talent, Pacific island talent – to bolster this team because it gives you X factor. “I certainly did that when I was with Leicester, with the Tuilagi clan that all came through and guys like [Vereniki] Goneva who we signed from Tarbes, so we’re hopefully going to bolster, certainly in the back line, with similar types. Meanwhile, Mata has praised the Edinburgh strength & conditioning staff, headed up by Nick Lumley, for transforming him as an athlete. “The first season here was a bit of a struggle but I have picked up every season since and that is mainly down to the strength & conditioning guys at the club,” the man who won an Olympic Sevens gold medal in 2016 said. “I think the training programme suits me a lot, especially the S&C programme because it allows me to do what I have been doing so that is one of the main things that encouraged me to stay for the next few seasons and get even better. “The S&C here, well it has changed my rugby from when I was in Fiji. For me it is just about doing my own thing and using my strengths and hoping they contribute to the team. 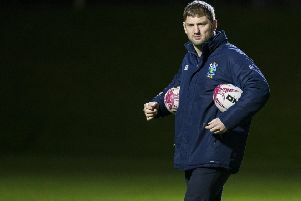 Cockerill has praised those behind the scenes at Scottish Rugby for making the new Mata deal possible.